May and June will arrive and most kids will bound through the doors of some school building praying they do not see those empty halls for at least three months. Parents will delight in the break from homework and fill the days with pool trips, camps, and clinics. 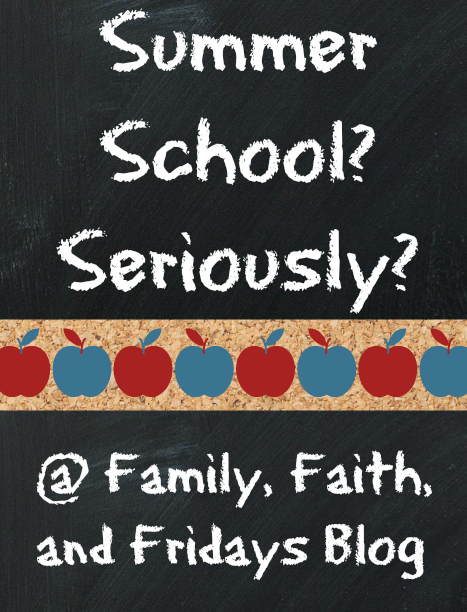 But we homeschoolers, well, let's just say we do things a little differently around here. Near of the end of the school year we have finished several subjects early and already our load has been lightened. When the final book is read and last workbook page is completed, we - well, we start again. Yes, I admit, I do usually give the kids a week or two off but then it is time to get going again. Seriously, how much pool and fun can one family take? We thrive on schedules. I am convinced that the key to peace and happiness is a schedule. OK, maybe not, but you get the idea. How many times do you hear people bemoaning the fact that they are ready for school to be back in session after just a few short weeks of summer fun? All-the-time! Why? Because their kids are bored. The parents are tired of playing tour guide and entertainer, are short tempered, and have run out of things to do. I do not even want to go there! So we don't. Yes, it is on a revised schedule. (I am not THAT mean) But it is school none the less. They all have summer reading and we require about an hour a day for that. Some of the kids actually have to be told to get their noses out of a book! We usually continue with math at a review level. I am not pushing for the kids to finish school at age 15, but I also do not want to have to spend the first month of each "school year" having to review forgotten skills because of a three month break. It is a complete waste of my time and theirs. An hour or so in the mornings of work is not going to kill them, and at the very best, it is teaching them to be hard workers and diligent. This year I have found a 10 week program for my 1st and 6th grader that reviews what they have learned in those particular grades. Because it is broken up into days and weeks, it is easy for them to follow on their own and so they will spend about 30 minutes a day doing that as well. My 10th grader will continue Spanish and begin duel credit online classes. Will they still have fun? Of course they will. We do like to have fun around here, I promise. Lots of field trips, time outside, and fun with friends. But we also want to make good use of our time and continue to emphasize the importance of learning. While it may not be an official "school day," everyday is about learning. Even in the summer! What about you? How are you filling your kids' summer days? No, luckily it is not really the last of joy- just the last of the month. 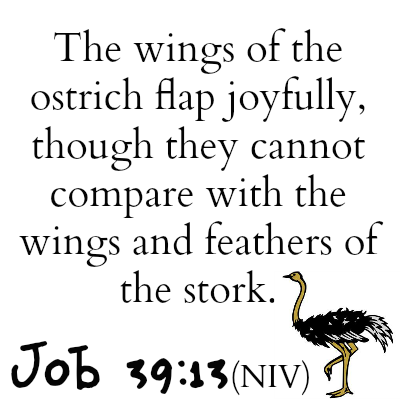 The joy can remain if we turst in the One who gives it to us. 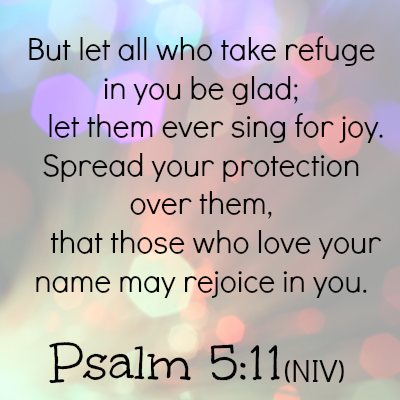 Let's take today to be thankful that God protects us and does indeed bring us true joy. Now, THAT is something to rejoice about! If you are hurting or in need take refuge in God- He will sustain you. See 'ya back next week for a new topic and verses. Once again it is my pleasure to team up with the Maxwell family from Titus 2 to tell you about their latest book coming out at the end of March. 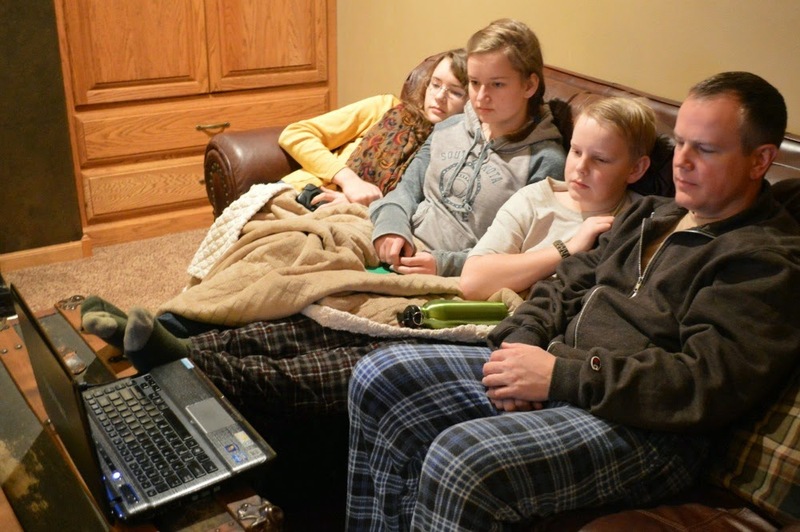 If you have been around Family, Faith, and Fridays much, you know that I adore not only this family, but their family ministry and resources as well. 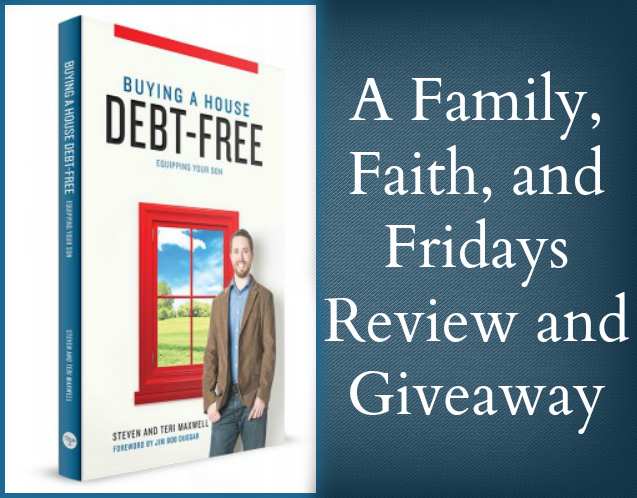 I was thrilled to be asked to be a part of a pre-release team that was blessed to read the book Buying a House Debt-Free in advance of the printing and am excited to tell you about it. Did you buy your house debt free? Did you know it was even possible? Quite frankly, it is a new concept to our family. And one that seems at first like a lofty goal. While we do feel strongly that one should remain debt free, in the past we have followed up that statement with, well, except a car or house. The Maxwells would say differently, and I must say, we are intrigued and challenged. As part of a family goal, the Maxwell boys aim at purchasing their homes debt free. Is it easy? No. But is it do-able? Yes! In the 240 pages of their new book, Buying a House Debt-Free, Equipping Your Son, the Maxwells not only show you how they have managed this lofty vision but how many others who have caught this vision have also done so. Each story presented is as different as the men they represent, showing that there is not just an easy 1-2-3 step process to achieve the debt free home goal, but this book does give many steps to help you work in that direction. The book covers topics such as working hard, getting skilled training at an early age to help you make more money, saving, and spending wisely. As always, each topic is presented from a Christian perspective with scripture to back it up. Even if you do not agree with everything they say, you can be sure that the Maxwells are sincere in their desire to help you and your family create a vision of buying a house debt free. They encourage you that it can indeed be done. After several of us read Buying a House Debt-Free, Equipping Your Son, we used it as a springboard for several discussions with our 12 year old in particular. His first response was, "Are you serious? I am only 12!" What that allowed us to do was open up a conversation on how we should never use age as an excuse and that if we do not set goals for ourselves we will never know where we want to go. It allowed us to brainstorm ideas for making money at his age, for listing some skills he would like to obtain, and to talk about college and job choices. If you feel ill-equipped to have those kinds of talks, there are discussion questions at the end of each chapter to help lead you through a conversation with your children. Through experience, we have learned that there is more than one way to get training and a job and we never want to limit our children by just falling into what the world would deem the "normal" path. Quite honestly, as a homeschooler, our son has much more time open to explore numerous trades and training options and we are encouraging him to do so. The Maxwell men serve as an inspiration to young men and have allowed our son to see that with God's help and blessing, anything is possible and that hard work pays off. For the visual learners out there, the charts will be especially helpful at seeing things like the number of years it could take to save $100,000 and the monthly cost of a debt free home versus one you are paying a mortgage on. Will he, or any of our children for that matter, buy a home debt free? That I cannot say. But I do know if they do not even try the answer will be NO! I for one, would sure love to see it happen and see the blessings that debt free living encompasses be passed to my children. How about you? With the Lord's help, ANYTHING is possible! The Maxwells have graciously offered to give one copy of their book, Buying a House Debt-Free, Equipping Your Son, to one of our readers. For your chance to win, please fill out the rafflecopter below. You can also buy Buying a House Debt-Free, Equipping Your Son from the Titus 2 website. The current price is $14.95. My little idea almost two years ago of reviewing products has slowly grown into a love for reaching out to you and each month brings a new opportunity in the way I get to do so. One of my new ventures is teaming up with Our Homeschool Forum, a wonderful site born of Rainbow Resource that features articles written by many talented fellow bloggers, a wonderful forum, reviews and more. And today- an article I wrote just for them is featured! I would love it if you stopped by their site and said hi! 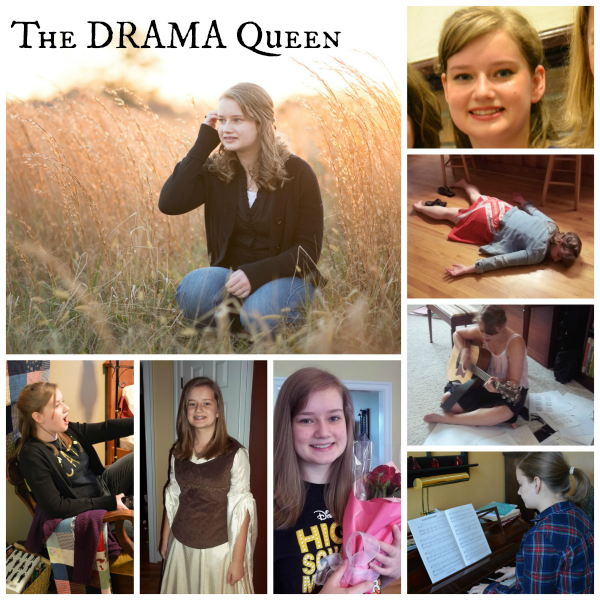 Shaking Up Spring Schooling on Our Homeschool Forum! Thanks friends for making this all possible! For friends who helped move us and all of our stuff into a different house. You know you have amazing friends when they take a break from their busy lives to spend days with you moving. For a house that is a more healthy environment for our oldest daughter. Every day that I wake up here I remind myself that we are so blessed to be here and without worry that the house is making her even sicker. For the smaller spaces. Seriously. This I have learned about myself - I am overwhelmed by large spaces. Not the spaces themselves, mind you. But the baggage they bring along with them. More places to clean. More to take care of. More space between rooms. More stuff! As we simplify our stuff, I love that we are simplifying our space. I love that our bedroom is just off the living room. I love that I can stand in the kitchen and still be a part of the living room conversation. I love that my boys are just a few feet away at all times. Call me crazy, but I love close and cozy. It frees my mind of clutter and makes my heart sing. For a normal school schedule. Yes, I missed doing school. Can you believe that? I love sitting at the table doing school with my kids. I love working through things with them. I love that we can study hard and then play hard. My family does better on a schedule. Which is good since they have a mom that loves schedules! For TOS Review Crew and the independent reviews that I do, as well. We are blessed weekly by review opportunities that knock my socks off. Like getting to see God's Not Dead before it was released. Reviewing a CD series that my family loves to listen to. Like finding yet another Spanish program that is challenging us to learn even more. It keeps me busy, but it also brings me a lot of joy. I have been asked to guest blog in several new venues and I love it. Can you believe that someone actually likes to hear me ramble on...other than my husband?! 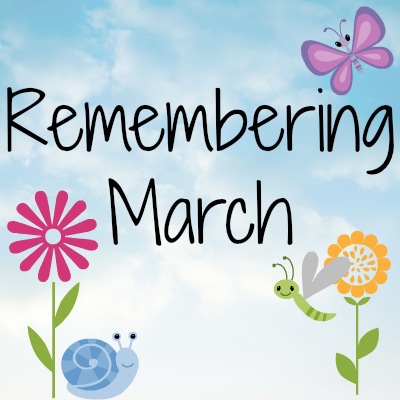 So, yes, school and life are how I remember March. And it is all good! I pray that you had a blessed month as well and are excited for April. I hear it may almost be spring...somewhere! Yep, I have a DRAMA Queen in my house. And I mean that in the nicest way possible. Riley is my girl who loves acting. And singing. And anything Broadway. And dance. And musicals. You know all those YouTube videos of people singing and acting? I am living in one of those videos. Add her sister and brother into the mix and they can act out whole scenes from plays and movies they have seen. Even some that they have not seen. Most of the time it is amusing. Sometimes not. Just saying. But I love that she has a passion. Mention an actor or actress and she can spout out what they have been in, where they got started, and what their next project will be. Give her a note and she will sing any song you ask her to. Ask her to learn a song on the piano or guitar and she is up to the challenge. Give her a stage and she lights up from the inside out. Get the idea? Theater, or "Theatre" as she insists, is her joy. It brings her joy. And that, my friends, brings me joy. Wanna go to a play, anyone? 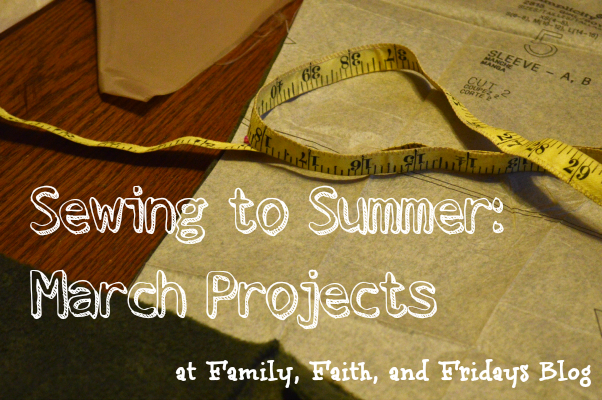 We are excited to be linking up with Jennifer at Milk and Honey Mommy for her Sewing to Summer series. Because of our recent Unexpected Move, our sewing was slowed down a little. The good news is we (OK, my daughter) gained a new, clean sewing room out of the deal and has started to settle in. Good thing, because just this week a local dry cleaners began giving out her name for alterations and she had her first customer come by with a few projects for her. What I really want to share with you this month though is one of her personal projects I got her into. She loves when I have these great ideas for her to try out. Haha. Hey, I have to live vicariously through somebody, 'ya know! I stick with quilts. and just knew her brother would love one! As it turned out, everyone wanted one and so she started with her brother and sister since the sizing was the closest and would not require such major adjustments. Brother wanted sleeves, sister wanted just the vest, so they have slightly different looks. Now we are all in line for fleece pullovers, especially now that you can get some good deals on winter fabric. Seeing as we had several inches of snow twice this week, I am assuming winter is still going to hang around South Dakota for a little while longer! still looks exactly the same. Hey, I have been busy hanging pictures! But next month, I assure you I will make some progress. Or at least lie about it! ;) One thing I really want to do is put initials on our cloth napkins for each family member. I will let you know how that goes. How about you? 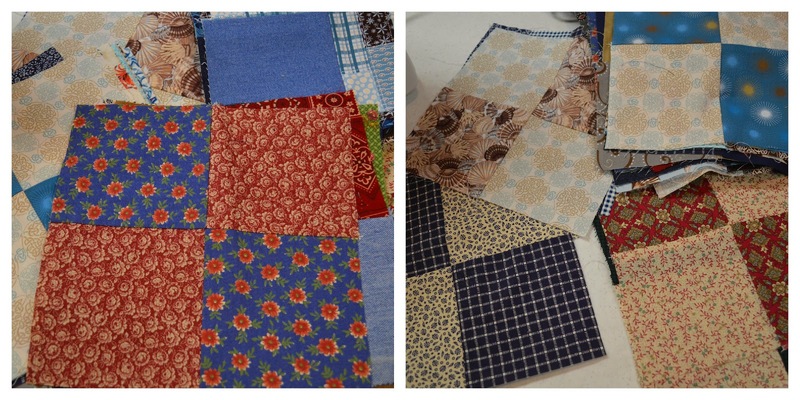 Are you busy sewing or do you have summer projects waiting patiently at your sewing machine? We would love for you to link up with us and share what you are doing! 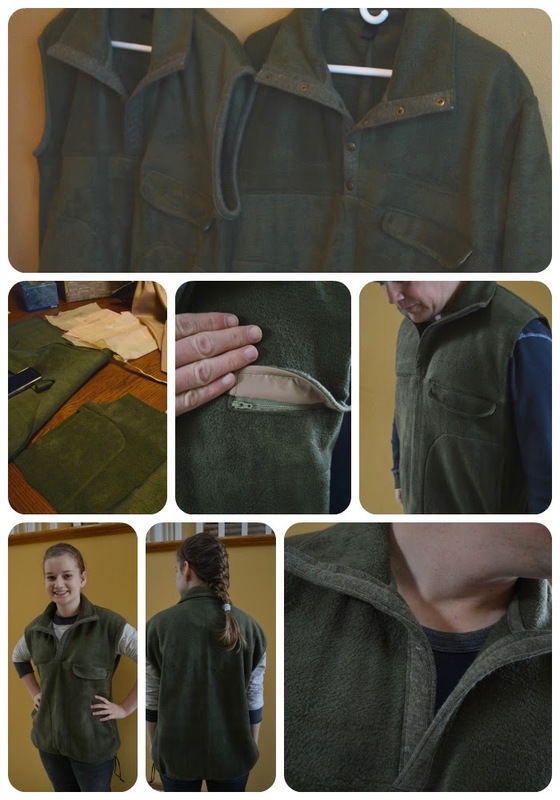 Head on over to Milk and Honey Mommy to see what are people are sewing! Once she stopped giggling, because she cracks herself up at times, she got serious and found this momma-approved verse instead. I like it. 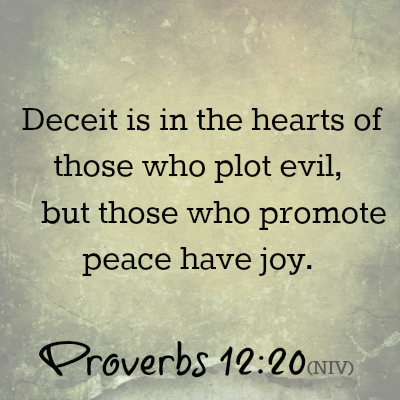 It is a good reminder to teach our children that we should not only have JOY but spread it to others as well. Do you remember me saying before that one of our family sayings is "Are you happy? Notify your face"? It is like that. Some people are not just naturally happy, joyful people. They need an extra nudge sometimes. They need a smiile, a kind word, even a hug. When we are kind and peaceful, we encourage those around us to be so as well - sometimes with only a simple smile. I challenge you this week to not only memorize this verse as a family, but see how many people you can bless this week by spreading the JOY! Yep! EJ's back! And this time she is headed for church camp and in for a big surprise. If you remember a while back I had the privilege of reviewing Annie Tipton's book Diary of a Real Payne - True Story and we loved it. So when Annie's publishing folks contacted me about reviewing the second in the series, we jumped at the chance. Diary of a Real Payne - Church Camp Chaos is just as funny and charming as the first book. The main character, EJ, is finishing up 4th grade and looking forward to a fun filled summer vacation, complete with a week of church camp. As before, the chapters alternate between the story and excerpts from EJ's diary. And just as before, EJ's imagination is in rare form. Often in the middle of what she is doing she imagines herself as a famous chef, a detective, a world famous golfer and so much more. In addition, there is an underlying mystery wovern throughout the story line that EJ must unravel. I don't want to give it away, but I have to tell you, it was one that particularly excited our family and makes us even more hopeful that there will be a third book to continue that theme! Once again, Annie Tipton has written a winner! She surrounds her fun stories with love, laughter, and adventure and makes family reading time enjoyable. To be able to find a story for this age group that is not full of fluff, but instead teaches character and honesty while celebrating a Christian family setting is rare! We can't wait til she does it again! Would you like to win a copy of Diary of a Real Payne - Church Camp Chaos? Just fill out the rafflecopter below. You can also purchase Diary of a Real Payne- Church Camp Chaos for less than $6 from Amazon. The two books would make a great gift for a child in your life, promise! Star Chronicles-A Bible-Based Study of the Stars group giveaway- Travel Scope, books, videos and more! Do your kids like looking at the stars? Have you studied them at all? In the past, we have not spent a lot of time on them aside from a general space study that briefly mentions the stars due to all of the evolution information floating out there. Sometimes it is easier to just let it go rather than sift through Truth versus not. Sad, but true. That is why I am so excited to currently be reviewing Star Chronicles: A Bible Based Study of the Stars by Dawnita Fogleman, a faith based unit study of the stars. Look for our full review on the 31st, but for now, let me tell you- fun! And informative! And did I mention it is from a Christian perspective? If you want to check it out you can find Dawnita at her website Fogleman Forerunner or on Facebook. To celebrate the upcoming release of Star Chronicles, I am excited to be joining the Star Chronicles Launch Team in sharing this fantastic giveaway, a perfect compliment to the Star Chronicles study and just plain fun for your homeschool! Star Chronicles: A Bible-Based Study of the Stars (paperback) $20 Celestron 70mm Travel Scope, sponsored by the following blogs: Ben and Me, Our Simple Kinda Life, Tots and Me, Marriage, Motherhood and Missions, Acorn Hill Academy, Family, Faith and Fridays, Our Homeschool Studio, As He Leads Is Joy, Angels of Heart, My So-Called Homeschool Life, Best Homeschool Academy by Mom to 3+2 Adopted Sibs, There Will Be a $5 Charge for Whining, Life Off the Paved Road $60 Astronomy and Space Unit Study and Lapbook + $30 gift certificate from A Journey Through Learning $42.50 Nature Study Bundle from Shining Dawn Books, including: Captivating Clouds, Remarkable Rain, and Flying Creatures of the Night $27 Moonfinder by Jay Ryan $15 31 Organizing Utility Tote in Sea Plaid $30 DVD Collection from 2 Kingdoms/Cathy Friedlander, including Seed Messiah, He Calleth Them All by Their Names, I Want to Explore, Raton Pass Hummingbirds, But Ask Now the Beasts, and Tzon El: Our Zionist Dream $80 A total value of $275! To enter, use the Rafflecopter below. Residents of the U. S. and Canada (excluding Quebec), age 18 and older only. See Rafflecopter for additional terms and conditions. 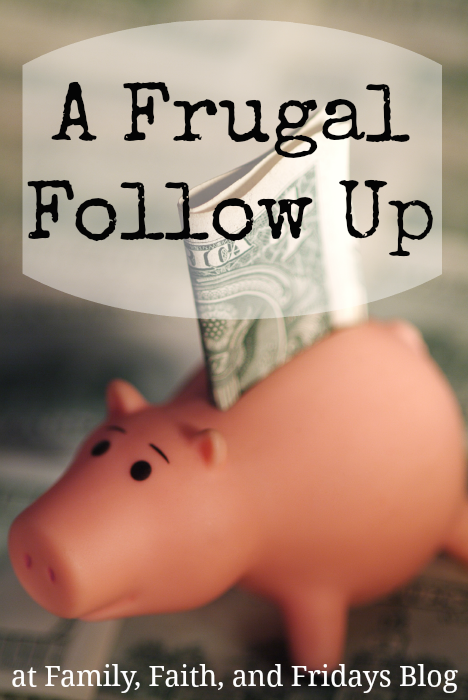 OK, did you know that if you mutter the word frugal people come running? Really! I am sometimes shocked at what you readers like to read as evidenced by the numbers on this blog any given day, but I must also admit I love that I am not alone in my quest to be frugal. We could form a group or something, I am sure of it. And your ideas- wow, you have some great ones. And since you left them all in numerous places for me, kind of like a scavenger hunt, I am putting them all here in one place for our little group to find easily. Plus, I am adding a few of my own! "I do the exact same thing but with whole turkeys on sale. I always feel that with chicken, it's just as much work to de-bone and pull apart but I get a lot less meat than with turkey. I frequently make quiche because it's such a money-saver and they all love it (plus we have our own chickens); Cornbread and beans is another frugal family favorite; Also meat and cheese in homemade bread pockets (Bierrocks in German). They're filling but you can really be creative and frugal with the filling, but since it's encased in homemade bread, the family always loves it." My friend Stacy reminded me of berries! "We always keep an eye out at the grocery store for berries to go on sale (sometimes I can get blackberries for 98 cents for the normal size square containers). When they are on sale I buy 12-14 pkgs and then make my own jam at home. I control the sugar amount and it's way cheaper than buying berry jam in the store. We also buy berries when on sale and freeze then in one cup batches to be used for making muffins of for quick and healthy snacks." Brad could have written a post all himself. I was so impressed by what he had to say we read it as a family and discussed how his suggestions impacted our life! "Don't rinse your dishes before putting them in the dishwasher. You're wasting water and effort. If both you and the dishwasher have to wash the dishes one of you is redundant. A good dishwasher can handle whatever food doesn't get scraped into the garbage." Yep, my kids loved this one. They think it got them out of dish duty. And mixes! Don't forget mixes. If you are buying stuff from the grocery store, most times you are paying double for the pretty packaging. We save a lot of money by making our own taco mix, salad dressings and onion soup mix. "Fans are a great way to cool down and much cheaper than AC. Just be sure to turn them off when you're not going to be in the room. A fan makes you cooler by whisking away your body heat. It will not cool down the overall temperature in the room. "Keep your blinds and curtains open on south facing windows during the winter to help warm your home with the sun. "Turn down your furnace at night and use an electric blanket to warm up your bed before you get in." "Never buy an extended warranty. They wouldn't sell them if they were paying out more than customers pay in. If you can't afford to replace or repair it you can't afford to buy it. "When you pay off your car loan keep making the payments, but send them to your savings account and don't touch that money. The next time you buy a car use cash and save thousands in financing costs. Always make the payments to yourself instead of the bank and always buy with cash after that. "Never put anything on a credit card unless you have the money in the bank to pay it off when the bill comes due. Then pay your bill in full - never carry a balance. No one would shop at a store where everything costs 30% more, so why pay an extra 30% or more for everything by using credit? A credit card is a great tool for building credit and for convenience over using cash or check but should never be used as a loan. "Build up at least a couple grand in your savings account for liquidity. It's tough to not use that expensive credit card loan unless you've got some cash in the bank to carry you through an expensive car or home repair, or unexpected dental bill. Think of your savings account like a cistern - if you want water during a drought you need to replenish it when the rain comes." 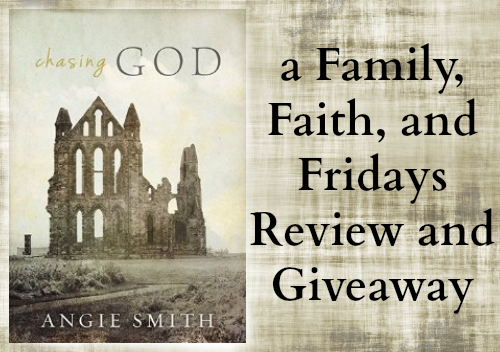 Chasing God by Angie Smith is a book you need to read. There, how is that for a starter? The thing is, I am serious! This 203 page book rocked me to the core these past few weeks. You see, I thought Chasing God was a good thing. Now I know it is not. Now I understand. And now, like Angie, I want to do things differently. Stop looking for Me, love. Look at Me. Who else needed to read that? I am good at looking for God. As a matter of fact, in some seasons of my life I have even excelled at it. I like lists. I like books. I like Bible Studies. And like Angie, I was pretty sure that doing all of those things was somehow going to teach me about finding God. But, also like Angie, all I found was I knew more about Him - not just simply KNEW HIM! Facts and checklists and studies and concordances do not automatically bring you closer to God. In her book Chasing God, Angie Smith takes you on her journey of learning how to know Him more closely instead of wasting time chasing Him. Without giving it all away or quoting everything I have highlighted in my book (that would surely take pages! ), let me share with you are few thoughts. Angie's and mine! "When we spend more of our time searching for assurance than we do acting out belief, we are chasing God (p 85)." See, there is that chasing God thing again. Not a good thing. Instead we need to trust in His will and act as if we do! So easy to say, often times so difficult to do. "Don't wait for the miracle you think will make it clear. Confess your unbelief and then act out of that determination (p 90)." This one really hit home for me. When we were in the early stages of adoption, we wanted things to be clear. "God, please send some sky writing," kind of clear. It wasn't until we stepped forward in faith that things started to work out. And yes, there was a chance that they were not going to work out the way we wanted them to. But we would have never known either way if we were still waiting for the sky writing. "Forgiveness is looking the pain straight in the eye and saying 'God is bigger than this' (p 123)." Ummm, yep, that one I highlighted and underlined and probably should have stamped on my forehead. Several years ago I had a disagreement with a family member that has now not spoken our family in almost 3 years. It is hard, it is hurtful, and it makes me bitter when I think about it. Not the right things, just being honest. But I reminding myself over and over that God is bigger than that situation. I may not be able to handle it, but He can! "...yes, He actually gives us way more than we can handle in every moment of every day. But He also gives us Himself, which allows us to carry it all (p 131)." Did you know that 1 Cor. 10:13 is one of the most misquoted verses of the Bible? The verse actually talks about temptation and God HAS given us a way out of that. Choose to say no. But, more than we can handle? Everyday! And that, as Angie says, is why we need Him! Oh, how I wish I could just go on and on. So many good things here, but you will just have to read them for yourself. I highly encourage you to do so. Or maybe grab a group of friends and go through this book together. There were plenty of times when I was reading it that I would have loved to have turned to a friend and said, "hmmm, what do you think about that?" If you would like a chance to win a copy of Angie's book Chasing God, just fill out the rafflecopter below. If you have read this or after you do, I would love to hear what you think as well! You can buy Chasing God from Barnes and Noble for $13.36. And in case Angie's name sounds familiar, yes, I reviewed her children's book Audrey Bunny! It is equally as amazing! What if you had to take a class from a professor who told you that God did not exist? What if you were told by that professor that you must write "God is Dead" on a piece of paper and then sign that paper and turn it in? What would you do? Josh Wheaten, played by Shane Harper, is faced with just that dilemma in the soon-to-be released movie God's Not Dead. And instead of forsaking his beliefs, he chooses to defend God to his entire college Philosophy class to prove that God is not dead. I have said it before, but it bears repeating, I am very hesitant to recommend movies. We are a quite conservative family. As in, my girls watched only movies with talking vegetables for many, many years! (Please do not ask them how long. They may be a little bitter! haha) But the movie God's Not Dead - well, I am telling you, it is worth seeing! Thanks to Fly By Productions, my family and I had the privilege of previewing it a few weeks ago. Yes, that is them, all squeezed on the couch watching on the computer...notice they left a small space for me. In a carefully woven story involving multiple characters, Josh begins a quest in which he has to prove to his fellow classmates that God is indeed not dead, or fail his class. Lest there be any room for confusion, Professor Raddison, played by Kevin Sorbo, has no intention of letting Josh pass. Regardless, with the help of a pastor and some intense research, he takes on the challenge, despite some bumps along the way. and of course, The News Boys who sing the title song. I have to tell you, we enjoyed this movie and are excited to see how it does in the mainstream theaters. There are a few intense scenes, one involving domestic abuse and one of an accident, so I would personally advise against allowing young children to watch. Our 12 year old son was not disturbed by them, but I was a little! There are a few plot twists that might surprise you and you have to really pay attention as the characters are plenty, but I think you will enjoy this movie. I know you will enjoy the music. And it may even help you in defending God when your turn comes. You will want to check out the trailer to get a glimpse of this movie! If you are looking for some encouragement and Godly posts, head over to Christian Mommy Blogger! Her Fellowship Fridays are are an amazing collection of posts that will not disappoint you!